Every year, friendly grey whales migrate to the warm, nutrient rich waters off Baja California. Between the months of January to March, hundreds of these whales spend their time off the coast of Baja, and specifically, Magdalena Bay. This is our third season visiting this region for grey whale encounters, and we are inviting you to join us for this 5 day (3 days whale watching), experience of a lifetime. We will be visiting the whales in February, which is during the peak grey whale season. Our home base during our time here will be Puerto San Carlos, Baja Mexico. A quiet fishing / whale watching community, which also boasts one of the largest gatherings of these whales off the Baja coast. The trip price is $1,350 per person, with a $500 deposit required to reserve your space. - Transfers from La Paz Airport to San Carlos (Round trip) 3 hour drive. The female whales here are extremely friendly and will often approach boats, seeking out attention from people. When they approach the boats, they rub up against them, sometimes even pushing the boats around. The curious whales will often spy hop, to look at the people in the boats, sticking their faces out of the water, giving people the opportunity to give them a face rub. They have been known to do this for hours at a time. These friendly whale encounters are the close up photo opportunities we are seeking out. This type of interaction is unique and very special. One day, the whales will be flirty and interested in interacting with us. Other days they may be mating or courting and have no interest in us. This is why we plan these expeditions over several days for the best opportunities to attain the images and the interactions you are hoping for. Please note; these are wild animal encounters, there are no guarantees that we will see any whales or that they will want to interact with us. However, we are traveling here during the peak season and we use very experienced whale watching guides that know where to look and how to approach the animals for the best possible interactions. When working with the grey whales in the bay, we hang off the sides of the boat and dunk our cameras in the water. (the pangas we use are low profile so it makes submerging your camera into the water for photographs easy). The clicking sounds the cameras make often attract the whales attention and they will come right up to your dome port. These opportunities are easily one of the greatest we have ever experienced for up close face shots of any whale species. Please note, Strobes are not allowed as the flashes spook the whales. Whales are not the only animals that visit the waters here. Magdalena Bay is also a popular bird sanctuary. Tens of thousands of brown pelicans, cormorants, and various sea birds migrate through these nutrient rich waters each year. Birds of prey species such as ospreys, turkey vultures, hawks and bald eagles can also be found nesting and hunting in these waters as well. We will visit a few of these rich birding areas (only accessible by boat) for unique photo opportunities. We will also spend some time at the end of the day, trying to photograph wild coyotes. There is a small, but healthy population of these wild dogs that hang around the beaches, picking up the scraps that the fishermen discard. These wild dogs are normally shy, but if we are patient, some of them may allow us to photograph them from a decent distance. These are long magical days at sea, seeking out wildlife, around the bays, estuaries and open ocean. Magdalena Bay has something for everyone. Photographers… we offer a unique opportunity on these trips. 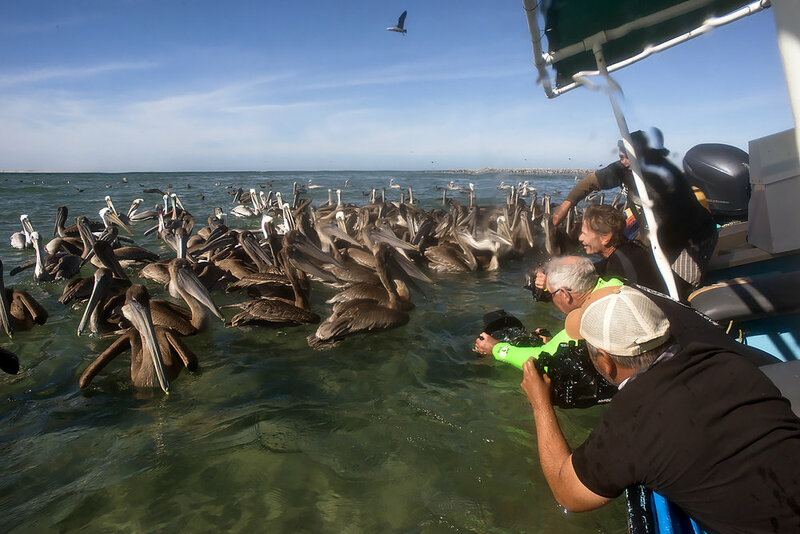 We will visit bird island in Magdalena Bay, which is where hundreds of thousands of sea birds roost every night, here we will drop our cameras in, or if you prefer, you can photograph these birds topside and capture some unique images of pelicans, feeding on sardines, or in flight. This is always a lot of fun and a great way to capture unique behavior. Day 1 - We will pick you up from the La Paz International airport between 1-2PM. Once we have collected you and your gear, we will travel to Puerto San Carlos. This is a 3 hour drive through stunning scenery. Once we arrive, we check you into your hotel room. (dbl occ.) The rest of the evening is yours to prep camera gear, relax and / or explore the town. Day 2 - 4 - 7AM. We have a light breakfast, then head out for our day at sea. Lunch, drinks and snacks are included. We spend the next 5 - 6 hours at sea, seeking out the best photo opportunities with the whales. Day 5 - We have a good breakfast, check out and we return as a group to Lap Paz for your flight's home. Departure time from Puerto San Carlos is 8AM. The drive is 3 hours so please make your return flights for after 12PM. Let us know you are interested in joining this expedition. Thank you for your interest in our Grey Whale Watching Expedition. We will send you more information on this trip. If you have any immediate questions, regarding the expedition, please feel free to call us, or send us an email.